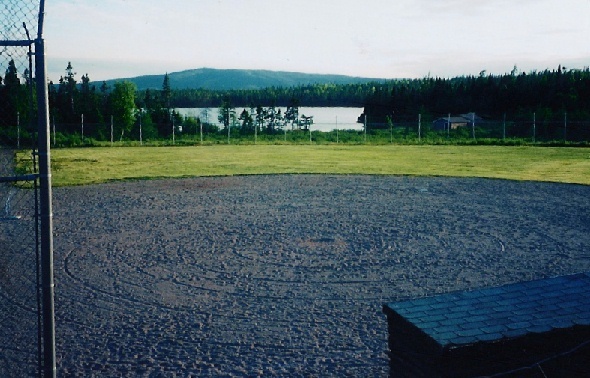 In the summer of 95 I believe it was, there was a softball tournament at the Lion’s Park at Elliott’s Cove Pond. And a good time was had by all. The end. Well that’s a kinda lame story, so will add a couple events. Hopefully I can be forgiven if I’ve mixed multiple events into one. For some reason I was umpiring that tournament or a lot of it anyway, not because I was necessarily any good, but more because no one else wanted to do it. Umpires of our softball games generally have to make all the calls for all the bases, and outfield as well, so sometimes the point of view can be difficult. That said, I really from that day to this cannot be sure I made the right call, just that I made a call. I can’t even remember specifics now, but for some reason I had called Craig Baker out at first, whether for being thrown out, or for being off the bag or whatever, I don’t recall. What I do recall though was something was said or done, and I threw Craig out of the game. I probably wasn’t amused at the time, but I know everyone else was laughing and I can only laugh now too as Craig took the bag and walked up the road and threw it out in the woods! That tournament was also unfortunately the site of an injury when Lisa Critch got her leg broken at 2nd base. Scary play, and so happy she recovered well. Summer days, where would the be without softball?